The Cooper’s hawk is a common but often misidentified backyard accipiter, and it can easily be confused with the sharp-shinned hawk or other backyard raptors. By learning this bird’s key field marks, it is possible to be more confident as you identify Cooper’s hawks both in your yard and in the field. Both male and female mature Cooper’s hawks look similar, though the females are generally larger. They share the same proportions and field marks, however, and careful study of these birds will yield easy clues to their identity. Dark Cap: The mature Cooper’s hawk has a dark gray crown that creates a cap-like effect on the head and contrasts with a slightly paler nape. The rear of the crown may also show a corner depending on the bird’s posture. 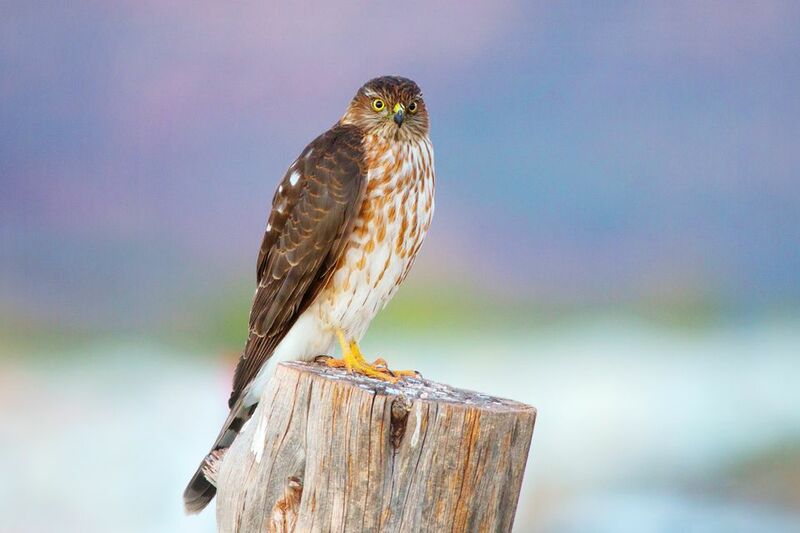 Red Eye: Mature Cooper’s hawks have distinct red eyes with dark pupils. Gray Upperparts: The back and wings of the Cooper’s hawk are a medium slate gray color with no notable barring, mottling or other markings. Barred Underparts: The breast and abdomen are white with a heavy rufous or rusty-colored barring that can be very dense and extends to the upper legs, though the under tail coverts are plain white. Tail Length: The Cooper’s hawk has a noticeably long tail that can make the bird seem even larger or overbalanced. The tail is marked with three dark, broad bars. Tail Tip: The tip of the tail is rounded and has a white terminal band. The width of the white tip can vary depending on how worn the feathers are, but it is nearly always noticeable. Legs and Feet: The legs and feet are yellow, and while thin, are roughly equivalent to the width of a pencil or child's pinky finger. Prey: Birders who are fortunate to see these hawks capture prey can use that prey for identification. While Cooper’s hawks will capture a wide range of small birds, they will also prey on birds as large as mourning doves, Eurasian collared-doves or even rock pigeons, while the smaller sharp-shinned hawk will not routinely take prey as large. Juvenile Cooper’s hawks can be puzzling to identify because they lack the distinct coloration of adult birds, but savvy birders can note a range of clues that will positively identify these birds. Yellow Eye: The best clue to identify a juvenile bird is the eye color. Young Cooper’s hawks have a yellow eye that will gradually darken to orange and then red as they mature. Underpart Markings: The juvenile Cooper’s hawk has a white chest and abdomen heavily marked with brown “drips” that grow thinner and taper off lower on the body. Barrel Shape: Both adult and juvenile Cooper’s hawks have a “barrel” shape with the shoulders and hips of similar widths, though this can be difficult to see depending on the bird’s posture. The most similar bird, the sharp-shinned hawk, has a much more distinct broad-shouldered look with narrower hips. Tail Tip: The tip of the juvenile’s tail is also rounded with a prominent white terminal band that may show varying degrees of wear. Identifying birds in flight is always a challenge, and the Cooper’s hawk is a fast, agile bird that may only give birders a brief glimpse as it flies past. Fortunately, if you know what to look for, even a brief glimpse can help you identify a Cooper’s hawk. Wing Shape: Cooper’s hawks show the typical broad wing shape of all hawks, with rounded tips. The wing is also held fairly straight across the leading edge. Underwing Pattern: The underwing pattern of both juvenile and mature Cooper’s hawks is a heavy barring that may resemble a “checkerboard” pattern. Markings are finer and more densely packed closer to the body and on the leading edge of the wing. Head Projection: The Cooper’s hawk’s fairly large head projects well beyond the wrists of the wings and can seem overly large depending on the viewing angle. Tail Length and Shape: The long tail of the Cooper’s hawk stands out in flight, and the white tip can still be visible. The tail may be held splayed out or in a more narrow configuration depending on the aerobatics necessary for the flying bird, particularly if it is pursuing prey. 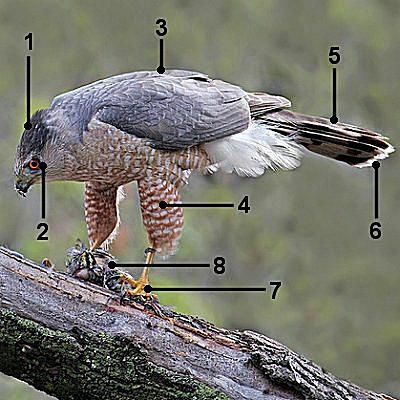 Cooper’s hawks can be confusing accipiters to identify, but with practice, every birder can learn the key field marks for both adult and juvenile birds to be able to accurately and confidently identify them, even in flight.